How did you get involved in the crafting world? Has it always been a passion of yours? I come from a very creative family and was always creating something from a very early age. A couple of my fondest memories are sitting with my Grandma at night making Barbie clothes by hand. She never used a pattern and they were always awesome. When I was a teen-ager my Mom began china painting and joined an artist guild. She painted beautiful flowers on trinket boxes and I would write the inscriptions inside. We sold these at the art guild shows and made enough money to take vacations to see our family in California. There wasn’t really a time in my life when I wasn’t creating something, it’s who I am and I am passionate about making things. I’ve done everything from decorative painting, wearable arts and sewing to sculpting and jewelry making. “Wearing my art” seems to be my focus these days. I kind of stumbled into the professional side of things. I was a stay at home mom to an adorable two year old boy, when my daughter came along. Unfortunately, she became ill at a very early age and was hospitalized a lot during the first several years of her life. I used crafts as therapy and a way to make an extra income to offset health care expenses. It was a perfect job for a stay at home mother. We did that as a family for many years. In 1996 I attended my first professional craft trade show known then as ACCI (Association for Crafts and Creative Industries) in Chicago. I signed up for the “designer forum” where I displayed my original designs for manufacturer’s, editors and the professional world to see. It was a huge step for me, but a positive one. I placed several projects in craft magazines that year. This was a huge stepping stone to get to where I am today. The ACCI and HIA shows have now merged with CHA – Craft and Hobby Association where I’ve teach classes for upwards of 150 students at a time, demonstrate products, provide consulting services and product development for manufactures. It’s at these tradeshows that I am able to network to meet new clients, catch up with designer friends and make new ones. I am proud to say that I have been mentored by the best. Donna Kato was and still is my mentor. 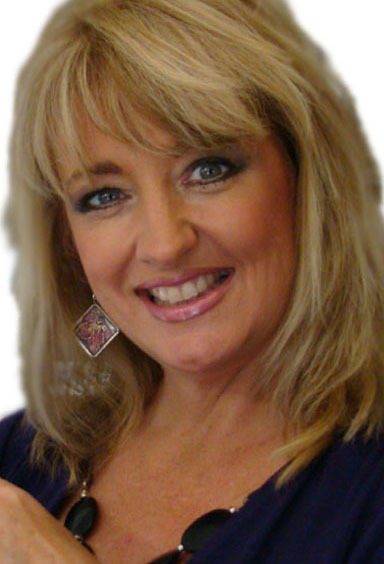 I credit her with much of my success in helping me hone my talents in a positive direction and for introducing me to many of her well known friends in the industry – such as Carol Duvall. Her generosity and passion to help others has really inspired me to do the same. I can only hope to be as successful of a mentor as she has to me! 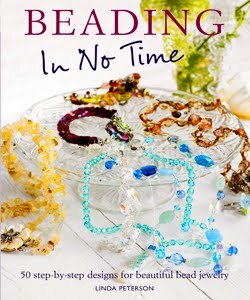 In your latest book, Beading In No Time, you present a myriad of jewelry-making techniques. How did decide which techniques and projects to include in the book? That’s a great question! 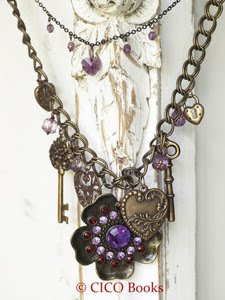 When Cindy [Publisher of CICO Books] and I narrowed down the concept of the book, I knew it would be a great challenge since there are a lot of other fabulous jewelry making books out on the market. How was I going to make my book different? My first thought was to inspire someone who never tried jewelry making to jump in and do it by offering jewelry ideas that were simple and quick to make. In this fast paced world, I felt that was really important, plus it gives you a huge confidence boost when someone says…” I love your necklace” and you can proudly say “THANK YOU! – I made that”. I also wanted to projects to build on skill level. So as you progress through the book, you will see that a variety of techniques are offered. The book is written so that you can mix and match your favorites – for instance, maybe you like the look of a certain necklace on one page, but you like the colors of another necklace on a different page. Mix and Match them for a look that is completely you! Great jewelry too, does not have to cost an arm and a leg. I kept that in mind when designing the jewelry. While I did use semi precious stones in many of the designs, they are affordable and the findings are easy to find in most major craft stores. I also tried to keep the projects very classic…because a good classic never dies, but ages well. That’s why I focused on building techniques and skill levels which helps the reader get their creative juices flowing and hopefully they will discover something in themselves that they never knew. Something else I thought about was all of the shows on TV that relate to style and makeovers. They focus on helping people of all shapes and sizes find ways to dress, accessorize and show off their best features. That was the inspiration of including the section on designing jewelry that fits you. I discuss different facial shapes, hair styles and how to create jewelry that is best suited to each of those. That way when you go out….you have the “WOW” factor! 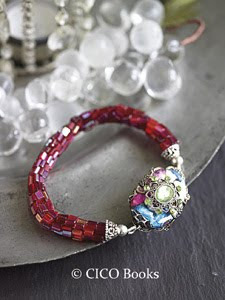 In Beading In No Time, you include tips on how to sell your jewelry. What are some of the best ways to get started and grow your business? I began 20 years ago, when there was no internet. We did not have the ease of online stores, sites like etsy, email or social networking. I grew my business with a good old fashioned mailing list. I took my mailing list book to every craft show I attended and followed up with newsletters and postcards afterwards. Technology has made is so much easier to connect to millions of people. My first suggestion to start your business is be realistic. I know we all want instant fame and fortune, and I do too, but that is not reality. Reality is hard work and endless hours of self sacrifice and self promotion. If you are new to starting your own business, by all means get business cards and postcards and hand them out like they are candy. There are many online stores that will sell your jewelry for a small price, so check out Etsy or Artfire are a couple off the top of my head. It’s very easy to open an account, snap a few pictures, upload and have an online presence. Create a blog and write about what you know. Share photos of your work as this can become your online portfolio. After you’ve done that, now the real work begins – the art of promotion. This is time consuming, but very well worth the effort. Social networking is a must! So join facebook, find your friends or find people with similar interests and begin networking. Let them know about what you do and what makes you unique. Be active online and blog alot! There are widgets available that allow people to subscribe to your blogs whenever you write new content. Keep these lists and email them newsletters to let them know of special events you are holding. Can you tell us about your involvement in CraftTech University and Cool2Craft? Absolutely, I’m very proud of these latest ventures. For many years we were blessed with craft tv. Networks such as HGTV, DIY and TNN saw the need to bring us wonderful craft shows such as The Carol Duvall show, Aleene’s Creative Living, DIY Scrapbooking and so on to millions of eager audience viewers. For one reason or another, the networks have dropped these shows and left us all out there hanging. I’m not sure why. In cooperation with Cool2Craft, I launched CrafTECH University in May. I’ve had the concept brewing for a couple of years, but the costs associated with bringing this about were out of my price range and the price I would have to charge for classes would be out of everyone elses too. Recently though, the web service that I use has lowered it’s fees allowing me to bring this concept to reality. At CrafTECH University or CrafTECH U for short, we bring together crafters with the best designers and instructors in the industry. Our classroom holds 25 people at the moment with room to grow and features 6 live webcams, a white board for slides and online and live interactive learning. The students can choose several levels of participation. They can watch and listen or participate right along side the instructor. If a student encounters a challenge with a particular technique, the instructor is able to help them work through it via webcam just as if they were there in person. At the end of class, we generally have a show and tell. The benefit to the student is that they are able to take classes in the comfort of their own home, with their own tools and with instructors that they might not otherwise be able to meet for various reasons. An added benefit to these classes is that they are recorded. Our students can go back and re-watch and pick up anything they missed. This has been a huge plus! We also offer the recorded classes for purchase as on-demand to those who were not able to attend. This format is great for those one the go, being able to view the class at a time convenient to them. You can check out all of our on-demand and current class schedule at http://www.craftechuniversity.com/ We are constantly adding new classes and growing our instructor base so check back often. As an expert crafter you are at the forefront of your field. 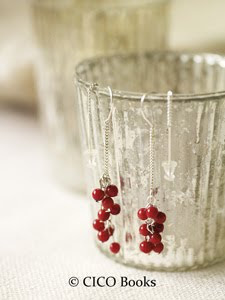 Are there any materials, types of jewelry or trends that are especially popular at the moment? What is the next big thing? In today’s economy, there is a huge surge in Do-It-Yourself for the obvious reason – it’s less expensive! Currently I am seeing a jewelry trend towards metal jewelry and steampunk upcycled and recycled pieces using found objects – especially industrial parts like gears and watch parts. Copper jewelry is growing in popularity since it is much more economical than silver, and easy metal to work with and the cost of tools is not out of range. I’m currently working on another book project with CICO, this time featuring Metalwork Jewelry which is now in the designing stages but will be released in March of 2011. I will be with Cool2Craft Live in September at the Creative Connection event (www.creativeconnectionevent.com) An event for creative women. I’ll be there with Tiffany Windsor and we’ll be broadcasting Live from the show. I will represent Amaco and will be showing the attendees how to create a great pendant on the go made from Friendly Plastic. And in December, I fly to New Mexico to tape several segments for PBS on the Creative Living with Sheryl Borden show. So pretty busy schedule…but it’s all GREAT!